「Kimono」is Japanese Traditional National Costume. We wear Kimono with long dress like bathrobe and 30 cm wide long band. In our time, we usually wear Kimono not as everyday clothes but as formal dress on special day. So people who rent Kimono only when they need it has been getting increased. Nowadays, some companies has stated the rental Kimono service for foreign tourists at around sightseeing spot. We can rent the full set of Kimono and can even get the dressing service. It is very popular service among foreign tourist. 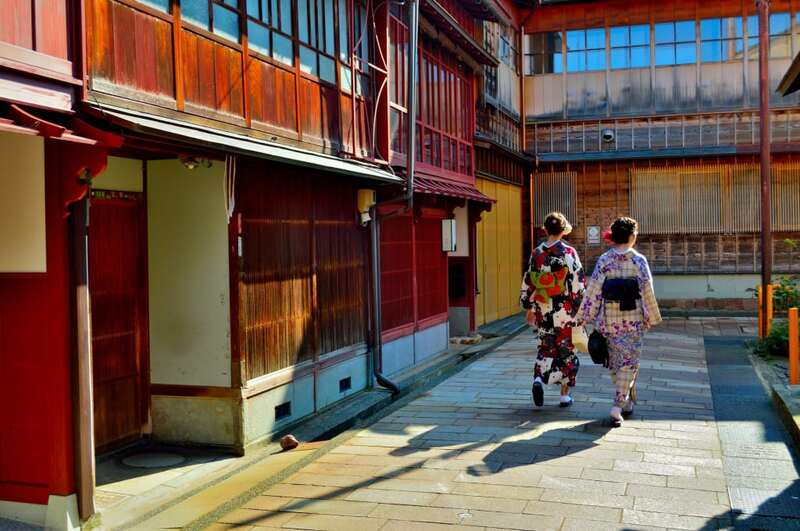 ・Introduction of the recommendable spot where we can rent Kimono and sightseeing in Kanazawa. When you rent a Kimono and go for a walk around the city while wearing Kimono, KENROKUEN area is good place. KENROKUEN is Japanese-Style Garden designed to make us feel Japanese seasonal beauties. It is taken as one of the Top 3 Japanese-Style Garden with KORAKUEN in Okayama city (Okayama), KAIRAKUEN in Mito city (Ibaraki). The attractive point of this garden is the beauty in harmony with nature that is unique to Japanese-Style Garden. Kimono looks very beautiful in its scenery. Higashi Chayagai is also good area as sightseeing spot where we could see Japanese good-old town and retro café that made from renovated old house. Both are close to Kanazawa station that has nominated as The World Beautiful Station. So please try to sightseeing there. It is Rental Kimono Shop only 5 min walk away from KORAKUEN. You can rent the full set of Kimono for a day and experience the dressing service by the staff who is professional of Kimono for 3000 ～ 5000 yen. Of course, you can select your favorite Kimono from various designs. This is the café where you can try precious experience of wearing Kimono made of 「Kagayuzen」 that is cloth dyed by Kanazawa’s traditional way of dyeing. It takes 10 min walk from KENROKUEN to get. It includes the full set of Kimono and dressing service by the professional staff for 5000 yen per 1 hour. But extra fee will be cost when it’s rain. It takes 9 min walk from KORAKUEN to get. This is the shop where you can rent antique Kimono that are designed as the Ukiyoe Art of Beautiful Women drawn by Yumeji Takeshita who was active in Taisho era. One day rental and dressing service is about 3000 ～ 4000 yen, and rental and photography service is about 6000 ～ 8000 yen.